Planting bulbs provides a garden with fresh flowers throughout the growing season. There are two general bulb categories: spring-blooming (including early summer- blooming) bulbs and summer/fall-blooming bulbs. Spring- bulbs are planted in the fall. Common examples include tulips, daffodils and hyacinths. These hardy bulbs must experience cold temperatures to bloom. If you live in an area that is too warm to grow these bulbs, you can provide a cold period to force bloom. See Forcing Bulbs for more information. Consider the light requirements of each plant. Most bulbs prefer full sun or partial shade. Since early spring bulbs bloom before most trees or shrubs leaf out, they can often be planted under trees and shrubs. A general rule for planting spring bulbs is to plant them three times as deep as the bulb is tall. So large bulbs like tulips should be planted about 8 inches deep, while smaller bulbs should be planted 3-4 inches deep. Summer- and fall-blooming bulbs grow best in warm temperatures. Summer-flowering bulbs include alliums, lilies, caladiums and cannas. Less well-known fall-blooming bulbs, such as the autumn crocus, are planted in the summer and add color to the garden at the end of the season. If you live in a warm zone, you can grow tender bulbs. Summer-blooming bulbs vary in their hardiness requirements, but many of them can be left in the ground all winter in zone 7 or warmer areas. Tender bulbs can also be grown in the north, but they must be planted in the spring and over-wintered indoors or replaced annually. Carefully select where to plant your bulbs. Most bulbs prefer full sun or partial shade. Summer-blooming bulbs grow and flower after the trees are in full leaf, so be sure to plant them where they won't get too much shade. Summer-blooming bulbs have varied requirements. Consult the information supplied with the bulbs. Catalogs are great sources of unusual bulbs. If you are interested in hard-to-find heirloom bulbs, check the catalog at Old House Gardens. If you're not sure which bulbs will grow in your region, start by purchasing bulbs from a local garden center. They will carry bulbs appropriate for your climate and can give you specific planting instructions. When buying bulbs, choose the biggest and firmest. Avoid soft, moldy, or bruised bulbs. If you can't plant your bulbs right away, store them in a cool, dry place. For information on storing bulbs for winter forcing, see Forcing Bulbs. Properly preparing soil before planting bulbs is important. Bulbs do best in well-drained soil. If your soil is heavy, improve it with organic material such as compost or peat moss. Work the organic material into the top twelve inches of soil. Plant bulbs with the pointed end up and the roots down. It's easy to tell which end is up on many bulbs, such as tulips and daffodils. Others, like anemones, are hard to decipher. If you're not sure, just plant the bulb on its side. Even if you plant them the wrong way, most bulbs will upright themselves as they grow. Some people prefer planting bulbs one at a time with a bulb planter, though it's easier to plant them in groups. Dig and loosen a large area of prepared soil to the proper depth, scatter a little bulb fertilizer, press the bulbs into the soil, and then cover them with soil. You can plant bulbs close together, but they should not touch each other. If you plant at least five or six bulbs in each hole, your plantings will look showier and more natural. 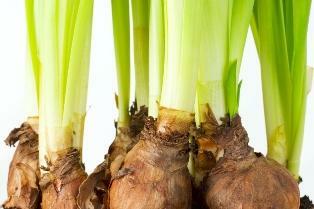 Water bulbs after planting to settle the soil and give the bulbs moisture to start rooting. Summer bulbs should be kept watered throughout the growing season. Let the soil dry out between waterings. Over-watering can cause bulbs to rot. You can help protect your bulbs from pillaging rodents by covering the planting area with chicken wire. Or try adding a handful of sharp gravel to the planting hole. After the flowers fade, bulb foliage naturally turns yellow. Avoid cutting back the leaves until they die naturally. Plants need the leaves to produce food to fuel next year's blooms. Disguise fading bulb foliage by interplanting bulbs with perennials. As the perennials grow, they will hide the unsightly bulb foliage. You could also plant annuals in front of your fading bulbs. Bulbs supply all the energy they need to produce blooms during the first year. After that, feed bulbs annually with a bulb fertilizer so they continue blooming in future seasons.